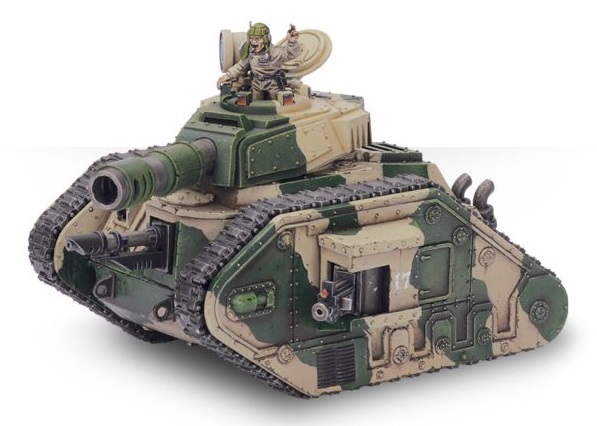 The war for Vigilus is heating up and the Imperium is pulling out all the big guns and new plans. 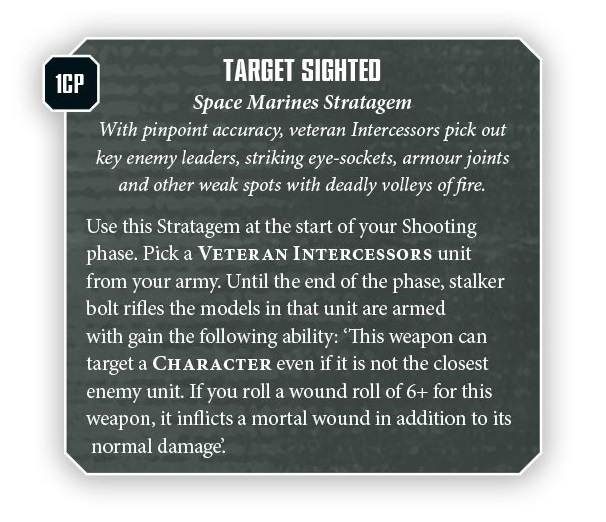 Games Workshop is previewing a handful of the new Imperial Specialist Detachments! Yesterday we got a look at what those sneaky Xenos are tapping into with their Specialist Detachments. 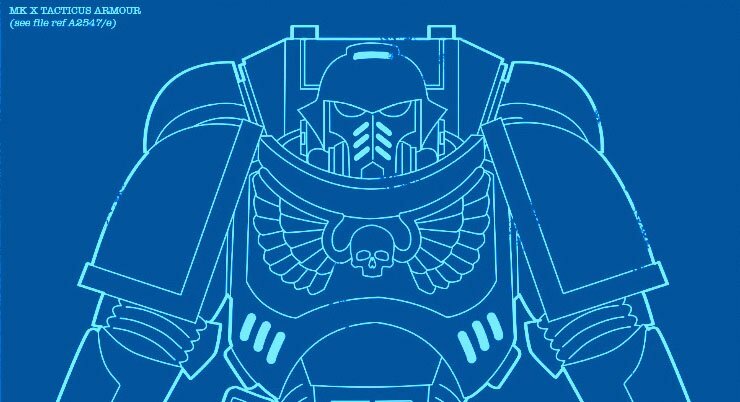 Today we’re diving into the might of the Imperium with their side of the coin. 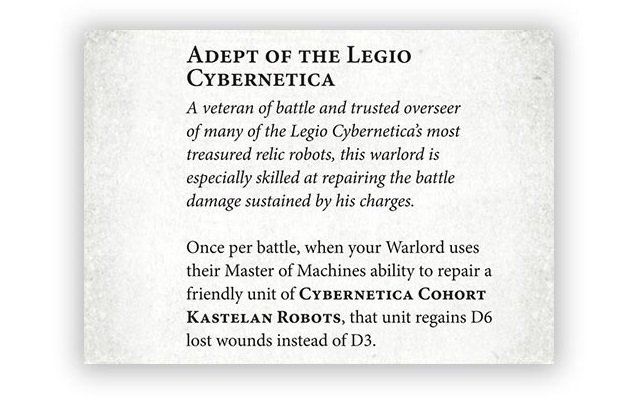 On top of that Games Workshop also has one more surprise for all these Specialist Detachments that could change the game even further. But first, let’s check out the new Marine Specialist Detachments! 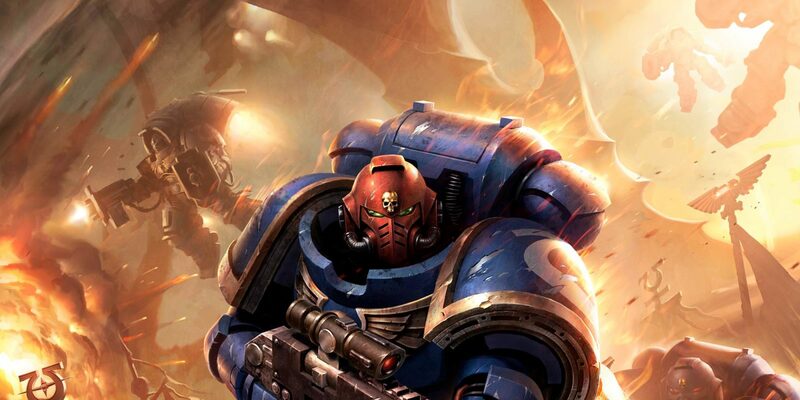 Veterans of the Indomitus Crusade pushed from Terra outward toward the stars by the side of Guilliman. They reclaimed and reinforced the beleaguered Imperial Forces and rolled out the Primaris Protocol to all Chapters of their brother marines. Now they are getting recognized with their new Specialist Detachment. 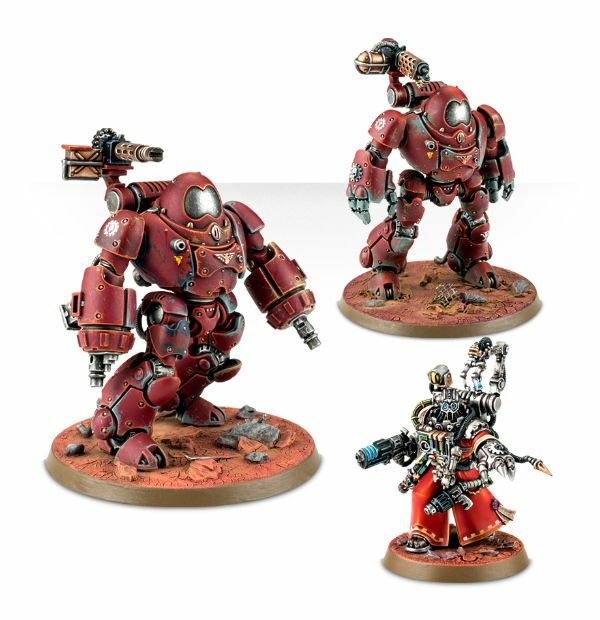 Fans of the Primaris Marines – this Specialist Detachment is built for YOU. 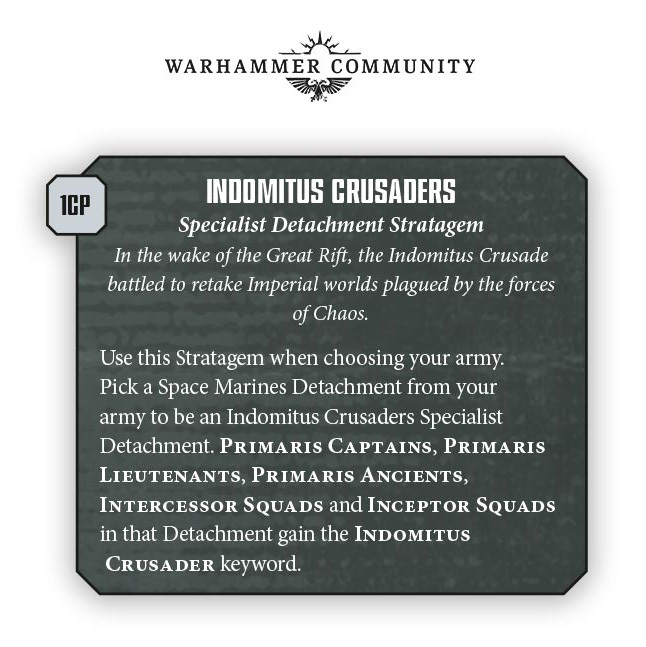 This grants the new Indomitus Crusader keyword to those listed units. That unlocks the option to include the new Grey Shield Warlord Trait and the Standard of Ultima Founding which we’re assuming is a new relic. GW teased they each provide a powerful once-per-game ability but we don’t have any clues on what those could be – but I bet they are GOOD! If you like running any of these units you’re going to want to take note here. 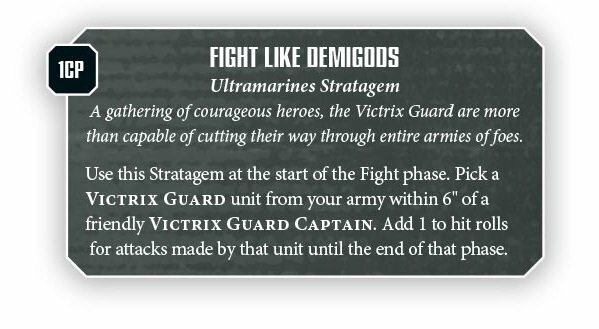 The Victrix Guard are getting some love from GW and they are pretty nasty! Did you get charged? Make the enemy pay by potentially activating TWICE in a turn and punching them to death for it! Sure it costs 3 CP but if you can take out the enemy’s big hitter before they get to swing I’d say that was 3 points well spent! I guess you just can’t keep a good robot down. Time to welcome our robot overlords? Not if the Astra Militarum have anything to say about that! Ideally (at least for the Imperium) the Astra Militarum’s guns are pointed toward the enemy. 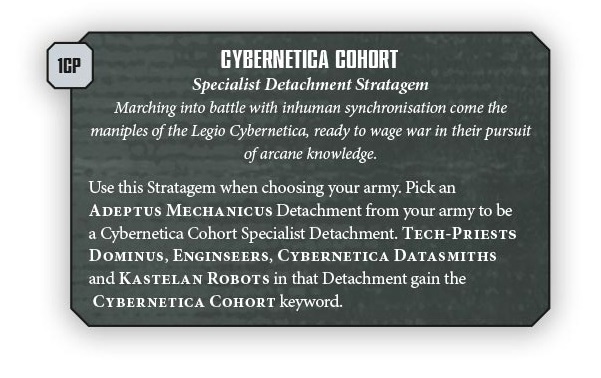 This new Specialist Detachment takes those already formidable Leman Russ variants and makes them even more deadly. Their Warlord Trait is called Unflinching Resolve and it allows “Emperor’s Fist units within 6″(of the Warlord) to re-roll failed hit rolls when firing overwatch” – not bad. Those tanks can spit out a LOT of fire (looking at you Punisher Russ). 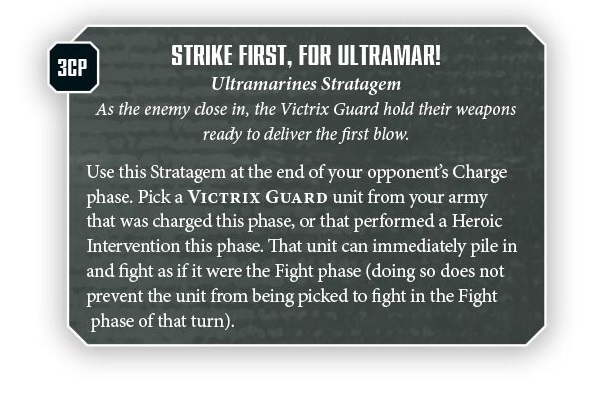 They will also get two more stratagems unlocked as well: One stratagem will “help your glorious Leman Russ to squish enemies on the charge” and the other will allow you to fire twice even if you advanced! Oh boy. Yeah buddy – the AM is bringing the BOOM with this new book. Now you can nominate “Field Commanders” and they ALSO get the Specialist Detachment Warlord Trait. On one hand, this is neat that GW is letting take the new Warlord Traits on top of your other Warlord Traits. 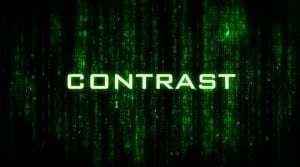 This will unlock a LOT of the Stratagems and is very useful. On the other hand, I’m not quite sure if I like this addition fully. 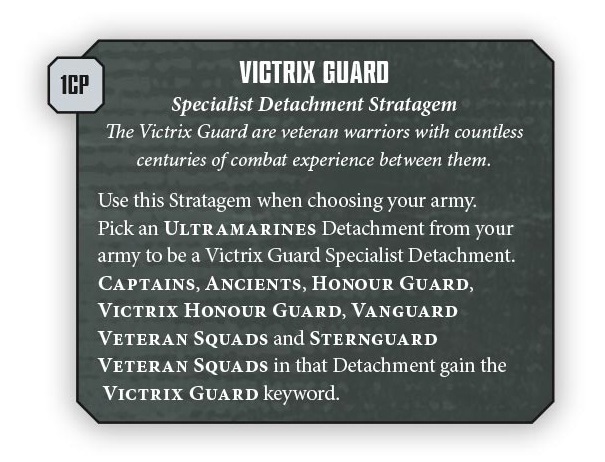 Part of the appeal of these new Specialist Stratagems was that you had to spend resources (CP) and you had to CHOOSE which options you take over the other. Maybe paying the CP was enough of a penalty and the sacrifice of choosing one over the other was just too much. I want to be able to have all the toys and play with them, too. However, I also understand that for the longevity of the game you’ve got to strike a balance. The Field Commander at least has a cost associated with it and that should help soak-up CPs. But for some armies, a CP or two is just a drop in the bucket while others might struggle to pay the toll for all those options. I guess we’ll have to see how this all shakes out when it hits the tabletop later! 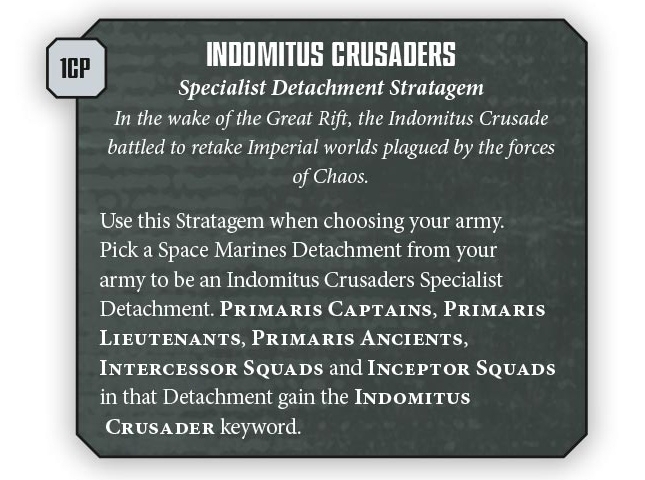 What do you think of these Specialist Detachments for the Imperium? 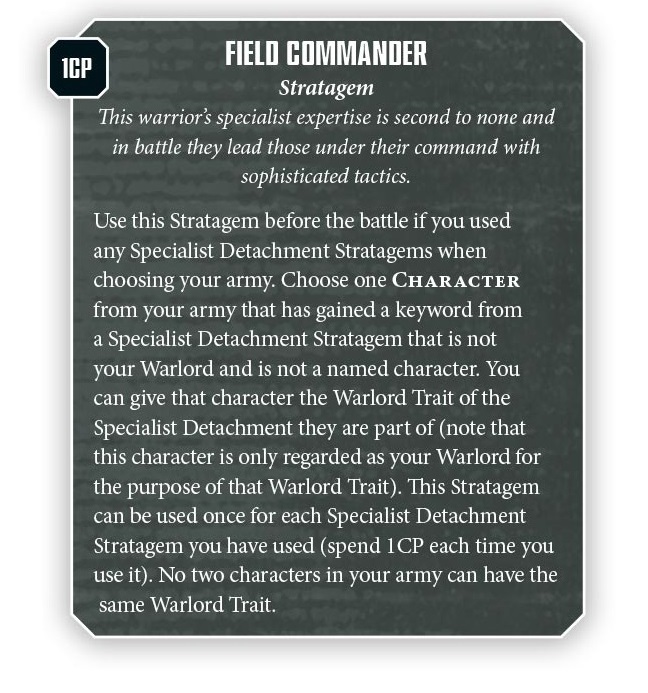 How about that bombshell Field Commander Stratagem?